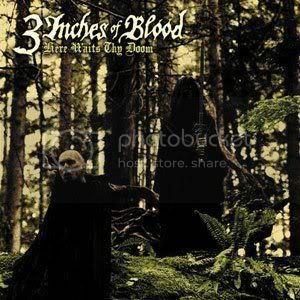 For those of you who have never heard 3 Inches of Blood before, think the Lord of the Rings-esque themes of power metal or Brocas Helm (3IOB actually has a song called "Destroy the Orcs"), the galloping instrumental work of a fast Iron Maiden number, and the voice of Rob Halford if he was always in his super high range and calling on medieval murder in the name of metal. Or just look up "Deadly Sinners" on youtube if your imagination doesn't compute that, the internet's a hell of a place. That formula has made 3 Inches of Blood one of my favorite newer metal acts since I first became aware of them at Ozzfest 2007, and saw them live at both The Door and Curtain Club in Dallas, where they became my favorite live metal acts for smaller venues. It also made their last album, Fire Up the Blades, one of my favorite things to blare through the speakers of a tiny Volkswagon Jetta. Oddly enough, that same formula is why this album isn't quite as exciting for me: the band may have done it too much. All but two tracks follow pretty much the same method of song arrangement, with a galloping riff here, some logical guitar breaks or solos there, and of course the trademark high notes of frontman Cam Pipes. Luckily though, they have used this formula enough to know how to execute it extremely well. Songs like "Battles and Brotherhood," "Rock in Hell," and "Execution Tank" may be typical of 3IOB's style, but they're also great testosterone inducing metal tracks with great riffs. Likewise, tracks like "Great Glacier" and "All of them Witches" make small tweaks to the formula like adding acoustic introductions, bass and drum breakdowns, and making the instrumentals ascend so that the thunderous guitars as well as the songs themselves are more intriguing. It's the songs that depart from the formula that not only stand out, but accomplish the most, however. "Cities on Flame" and "Preachers Daughters" both have awesomely catchy and somewhat bluesy riffs, with a slower beat that reminds one of Dio's "Straight Through the Heart". "1234" is a short, but sweet spanish guitar track that nonetheless sounds great and makes the record feel more like a complete musical excercise than simply a compilation of songs. It is worth mentioning that while frontman Cam Pipes is the voice you will hear for most of the record, Justin Hadberg has replaced Jamie Hooper on back-up vocals. The result is hit or miss, as early on in the record these vocals sound like they try too hard and fail to sound tough, yet as the album progresses Hadberg's voice sounds like just the right kind of evil. This neither makes nor breaks the CD, partly because back-up vocals are rarely heard, but it certainly sounds different from the older style of Mr. Hooper.